Special directions are usually supplied by the maker for each kind of boiler, or for those which are to be managed in any peculiar way. The following general directions apply to all makes, and may be used regardless of the type of boiler employed. Before starting the fire see that the boiler contains sufficient water. The water line should be at about the center of the gage glass. The smoke pipe and chimney flue should be clean and the draft good. Build the fire in the usual way, using a quality of coal which is best adapted to the heater. In operating the fire keep the fire-pot full of coal and shake down and remove all ashes and cinders as often as the state of the fire requires it. Hot ashes or cinders must not be allowed to remain in the ash pit under the grate bars but must be removed at regular intervals to prevent burning out the grate. To control the fire see that the damper regulator is properly attached to the draft doors, and the damper; then regulate the draft by weighting the automatic lever as may be required to obtain the necessary steam pressure for warming. Should the water in the boiler escape by means of a broken gage glass, or from any other cause, the fire should be dumped, and the boiler allowed to cool before adding cold water. An empty boiler should never be filled when hot. If the water gets low at any time, but still shows in the gage glass, more water should be added by the means provided for this purpose. The safety valve should be lifted occasionally to see that it is in working order. If the boiler is used in connection with a gravity system it should be cleaned each year by filling with pure water and emptying through the blow-off. If it should become foul or dirty it can be thoroughly cleansed by adding a few pounds of caustic soda and allowing it to stand for a day and then emptying and thoroughly rinsing. During the summer months it is recommended that the water be drawn off from the system, and that air valves and safety valves be opened to permit the heater to dry out and to remain so. Good results are however obtained by filling the heater full of water, driving off the air by boiling slowly, and allowing it to remain in this condition until needed in the fall. The water should then be drawn off and fresh water added. The heating surface of the boiler should be kept clean and free from ashes and soot by means of a brush made especially for this purpose. Should any of the rooms fail to heat, examine the steam valves at the radiators. 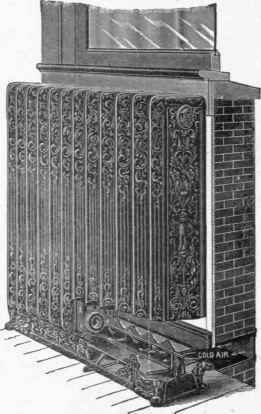 If a two-pipe system both valves at each radiator must be opened or closed at the same time as required. See that the air valves are in working condition. If the building is to be unoccupied in cold weather draw all the water out of the system by opening the blow-off pipe at the boiler and all steam and air valves at the radiators.